This week’s Gospel leaps directly into last week’s headlines. ..it is not what goes into the mouth that defiles a person, but it is what comes out of the mouth that defiles.” … Do you not see that whatever goes into the mouth enters the stomach, and goes out into the sewer? But what comes out of the mouth proceeds from the heart, and this is what defiles. For out of the heart come evil intentions, murder, … theft, false witness, slander. All kinds of evil words were shouted from the mouths of people in the streets of Charlottesville VA by people who hate and who threaten – false witness, slander, evil intentions, and yes, murder. What comes out of their hearts is offensive and scary. The president missed the importance of this when he seemed surprised by people’s negative reactions to him not immediately condemning the hate groups. He revealed his heart? In the second half of this reading, Jesus moves into foreign territory and encounters a foreign woman who asks for his help. He is a bit of a jerk here. Other people get twitchy about that and try to explain Jesus response. But, I’m saying that really, he was a jerk. First, he ignores her, then implies she is a dog. But she does not let the insult defer her. Using language from not so long ago: And yet, she persisted. Jesus finally heals her daughter and commends the woman’s faith. From Peter Walker: ..what if we don’t even try to justify Jesus’ actions by shaping him to fit our agendas? I don’t think it’s necessary or even ethical to defend words that seem so blatantly unkind. Jesus’ probably doesn’t need our protection. The Canaanite woman probably does. That is what is wrong with not condemning the “White Unity” marchers this past weekend. It isn’t necessary or even ethical to defend words so blatantly hostile. I think after Jesus’ encounter with this woman, Jesus would encourage us to persist in the face of what is coming from the hearts of many right now. 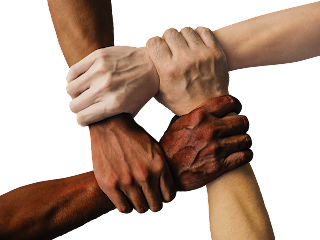 From the ELCA’s social message on Racism, Ethnicity, and Culture: Racism - a mix of power, privilege, and prejudice—is sin, a violation of God’s intention for humanity. The resulting racial, ethnic, or cultural barriers deny the truth that all people are God’s creatures and, therefore, persons of dignity. Racism fractures and fragments both church and society. As Jesus’ followers, we are called to speak out against the violation of God’s intention for humanity. May our hearts reveal instead God’s love. My personal frustration is that so many are not speaking out. This is the one time in your life as a Christian that we all must speak out and condemn such hatred. Now is the time!